Paul studied architecture in the southwest in the 1960's. The emphasis of his education was not on style but on process and context. He was fortunate to have studied the work of Frank Lloyd Wright and to have Poalo Solari as a lecturer. He learned, in the harsh Arizona desert, to respect the building site, orientation, its' context (be it rural or urban) and the impact the environment has on that site and on the completed structure. As a young architect, Paul started his practice in central coast California at the age of 31. He soon became aware of a design consideration that was not taught at the university, the necessity to be sensitive and respectful of clients' needs, be they programmatic, emotional and/or budgetary. This awareness was a matter of survival and the key to a successful project. Paul has continued to study and practice his trade and has reached a place of comfort. He has been able to develop his own projects and work with wonderful clients, creating spaces of tranquility and calm as a balance to this hectic world. We purchased this late 19th century building in downtown Vinalhaven in October 2016. The building was constructed on North Haven, the island to the north of Vinalhaven. Together the two are called the Fox Islands. Our building was moved to Vinalhaven in 1906 to take the place of the original structure on the site that was destroyed by fire. Over the years this building had seen many uses, all commercial and contributing to the vitality of the downtown. We wanted to downsize from our home and business in Wiscasset. We had lived in Wiscasset and grew our businesses for thirty years. We raised our children. Now it was time to move on to a new adventure. 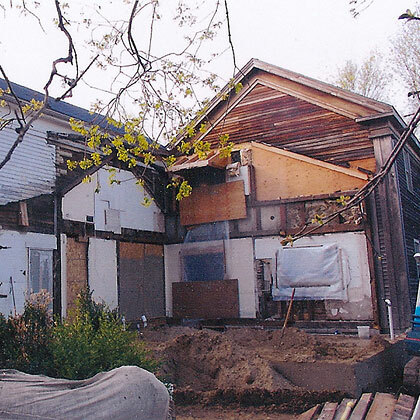 In order to make the building work for our needs, we went thru a complete interior demolition. During this discovery process, we decided to replace all plumbing, electricity and some structural framing. This is normal in the reconstruction of buildings that are being repurposed. The before and after photos illustrate the transformation of both floors. We now have our main living space above the first floor shop. Our bedroom is on the first floor with water, Carver’s Pond, on three sides. We are sleeping on a house boat. In 2006 we purchased a four story part of the grand 17th century home in Apt, France. The home had not been lived in for several years and although there was a limited electrical service, plumbing and heating, these systems were likely the first in the building and installed 30 to 40 years prior to our becoming owners. The grand home had been purchased by a business that subdivided the building into eights pieces. Each piece became an apartment. The "promoter" replaced the roof, preformed minor repairs to the façade and brought new electrical and water / sewer service to the property. After that each of the apartment owners was responsible for the work inside each piece. We purchased four pieces and a weed filled, cement covered courtyard. We started at the fourth floor linking it to the third floor with a new interior staircase. This gave us a new two bedroom apartment. The second floor became the one bedroom. We built an exterior terrace that is adjacent the bedroom. The living room space is large enough for a kitchen on one wall. We have taken part of the ground floor and created a work room with an adjacent bath / laundry room. This floor has access to the courtyard that is still overgrown with weeds. We have shown here some before and after photos to try to capture the extent of our work. Photos cannot tell the story of how we worked long hours with local craftsmen to achieve an almost impossible goal, three habitable apartments that we can share with friends and clients. 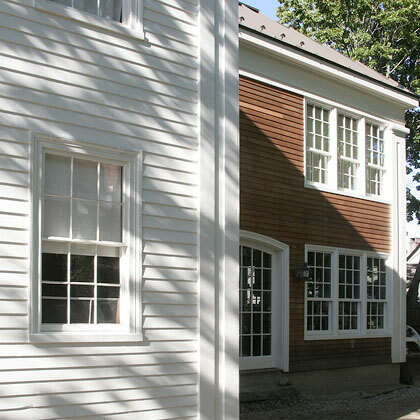 In 2009 I was asked by my neighbor, an antique dealer who had just purchased the old Nonesuch House, to help him with the design of the addition that he was planning for the rear of the wonderful early 19th century home. Over the years various additions had been made to the building and all were terribly designed and finally deteriorated to the point where they did not make a positive contribution to the new owner's living requirements. By the time that I entered into the project, a foundation had been poured. No plans were made beyond that. My challenge was to integrate the addition with the existing structure, balance the façade design with the existing and solve a difficult roof connection. 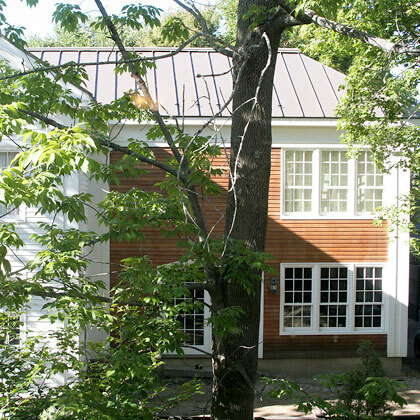 My client loved the 19th century building and had the intuitive design sense to be able to make good decisions. Being a successful antiques dealer he had good taste as well. We worked well together and the scope of my involvement in the project turned out to be more then initially anticipate. It turned out to be a project that we both are proud of.